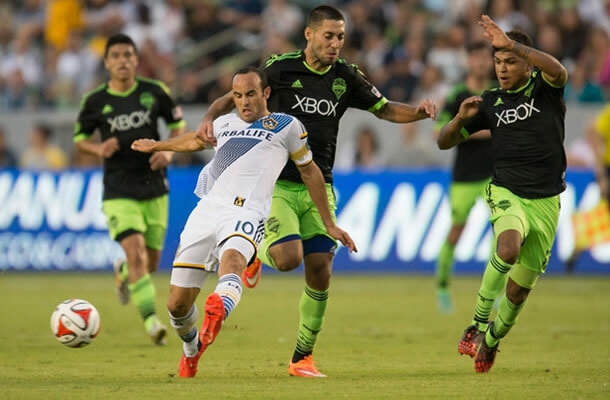 Last night, the Los Angeles Galaxy and the Seattle Sounders faced off in the first leg of a home and home that will not only decide who wins the Western Conference, but also the MLS Supporters’ Shield. Up 2-0 somewhat deep into the second half on goals by Baggio Husidic (’46) and Marcelo Sarvas (’50), the Galaxy allowed Seattle to come all the way back to tie the game on strikes from Clint Dempsey (’69) and Lamar Neagle (’72). L.A. could have had three points, but will settle for just one. Let’s see how dropping these two points affects the race. For those of you who don’t know, it’s fairly important to win this Supporters’ Shield. The Shield is a trophy that goes to the team at the top of the regular season MLS table. Outside of the fantasy leagues I participate in with my buddies, where the regular season winner gets their money back, there isn’t another league in America that rewards best regular season record. In this country, it’s usually all about the playoffs and the league championship. In MLS, the Supporters’ Shield winner is rewarded with one of the four MLS CONCACAF Champions League spots. For those of you wondering, the other three spots go to the MLS Cup winner, the Lamar Hunt U.S. Open Cup winner and the team with the best record in the opposite conference as the Shield winner (everybody got that?). This means that whoever does not come out on top in this home-and-home between the Galaxy and the Sounders will have to win MLS Cup to get into the Champions League. Coming into these matchups with Seattle, the two teams were tied at the top of the table with 60 points each in 32 games. Because Seattle holds the wins tie-breaker, the Galaxy needed four points (a tie and a win) to guarantee the Supporters’ Shield victory. Now maybe you can see why blowing a two goal lead in the last 20 minutes at home is a huge deal. Had they held on to win, the Galaxy would have been in the driver’s seat heading to Seattle next week, needing only a tie to clinch. Now, they are going to have to win outright in front of possibly 50,000 or 60,000 people at CenturtyLink Field to get the Shield. 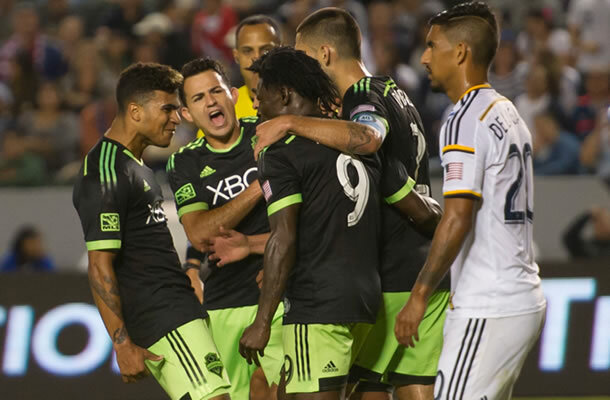 Including all competitions (MLS and U.S. Open Cup), the Sounders have only lost four games at home this season. For that matter, they’ve only even drawn twice there. That means 16 wins in 22 games at CenturyLink. It’s not going to be easy for the Galaxy to go there and win such a high pressure matchup. The one thing Los Angeles can point to in order to build confidence for this game is that one of those four losses was against this very Galaxy team back in late July (3-0). That being said, as a new Galaxy fan myself, I don’t feel too great about it. Here’s hoping for one last bit of magic from Landon and the boys next weekend.